On the Ravens’ very first place from scrimmage Sunday night, Ray Rice took the handoff from Joe Flacco, ran right, cut back left, slipped a Troy Polamalu tackle, and was off to the races for what appeared to be a game-opening 76-yard touchdown run reminiscent of the one he had in the playoff game in New England in 2009. However, a dubious holding penalty on Torrey Smith negated the play. Off the top of my head, I can think of no fewer than four instances of the Ravens putting the ball in the end zone at Heinz Field, only to see the scores come back due to some home cooked laundry on that sorry excuse for a field. And then you have last night. Throw in Smith being unable to tap his toes inbounds on a well-thrown end zone fade from the 12, and the zebras prematurely blowing a play dead while Rice fought to get into the end zone at the goalline, and the Ravens would again be forced to settle for three points. Instead of 28 total points from those plays, the Ravens ultimately managed only 9. I bring this up to point out the feeling that every Ravens fan found themselves dealing with after just a single drive of this key divisional matchup. It was shaping up, from the outset, to be yet another instance of the Ravens falling just short against their arch rivals. When James Harrison forced a Flacco fumble, then Ben Roethlisberger found Mike Wallace (not on purpose, though) from 25 yards out with just over five minutes to play to give the Steelers their first lead of the night, Ravens fans everywhere resigned ourselves to our fates. We’d seen this movie too many times before. Flacco, however, had a different sequel in mind. Just as he did in the regular season at Heinz Field last year, Joe would once again dice the vaunted Steel Curtain and send the Yinzers home crying in their little yellow rags. Last year, though, Joe did it on a short field. The odds were stacked much higher against him this time around, as the offense took over from their own 8-yard line with 2:24 on the clock and only one timeout, trailing 20-16. Mike Tomlin has proven himself to be a very, very good NFL coach, but two strange gaffes ending up really costing his team last night. The Steelers faced 3rd-and-5 from the Ravens’ 29-yard line with 2:37 remaining. Instead of running the ball and forcing the Ravens to use their final timeout or let the clock tick down to the 2-minute warning (assuming they were able to stop the Steelers from gaining 5 yards; if they get a 1st down, the game is basically over), Roethlisberger dropped back to throw, ultimately missing Mewelde Moore and essentially granting the Ravens an extra timeout. Following that, the Steelers lined up for a 47-yard field goal try into the open end of Heinz Field. If Shawn Suisham hits that, the Ravens need a touchdown and an extra point just to force overtime. However, the play clock expired, nobody on the Pittsburgh sideline seemed to notice (or care? ), and the ensuing 5-yard penalty forced Pittsburgh to punt. I’d have to imagine the talk radio shows in Pittsburgh are blowing up this morning with people questioning the clock management of Tomlin there. Still, you have to assume Tomlin had 100% confidence in his defense to prevent the Ravens from driving the length of the field to win the game in just over two minutes. Unfortunately for him, of course, that confidence was completely unwarranted on this night. The drive wasn’t exactly perfect from Flacco, and he saw his share of luck – good and bad – on it, but in the end it got the job done and catapulted the Ravens to 6-2 atop the standings in the AFC. The bad luck: Dropped passes. 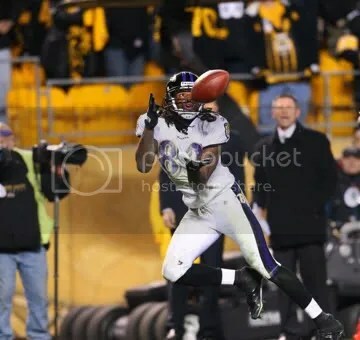 As was the theme for a good part of the night, Ravens receivers just plain old had a case of the dropsies. Smith dropped what should have been the go-ahead touchdown from 37 yards out with :42 on the clock (but hey, in his defense, maybe he just knew that if he caught that one, it would have given the Steelers too much time to get into field goal range to tie it up! ), and the usually sure-handed Boldin dropped a crossing route that would have set the Ravens up near the Pittsburgh 10-yard line with time for at least 3 throws into the end zone. The good luck: Joe nearly saw yet another of his game-winning drive attempts end with the ball in the hands of the other team. On 3rd-and-1 from the Pittsburgh 49, he made the wrong read and put the rock right on the hands of Larry Foote, who, unfortunately for Joe, plays for the Steelers. He lucked out when Foote was unable to corral the interception. On the penultimate touchdown pass, safety Ryan Clark woefully misplayed the ball, perhaps underestimating the speed of Smith. All kinds of luck aside, it was just the kind of drive that so many Ravens fans who are still on the fence about Joe the Quarterback had been waiting for. The same ones that, had the Ravens lost this game, would have been blowing up the talk radio airwaves and blog comments today blaming Joe’s fumble for the loss, completely disregarding all the times his receivers betrayed him as well as the fact that the Ravens defense reverted back to their 2010 form, blowing a double-digit fourth quarter lead. Speaking of the defense, it was a bit of a disappointing outing for Chuck Pagano’s unit, who allowed 392 yards, caused only one turnover and registered just one sack on Roethlisberger. Give Pittsburgh credit for a strong offensive line performance and a good game plan that took Terrell Suggs and Haloti Ngata out of the game for the most part. Sizzle looked like he was going to have to open up his fridge and give Ben’s behind back to him until he jumped in front of a bubble screen and intercepted him early in the third quarter (a pick is worth at least 2 or 3 sacks, right?). 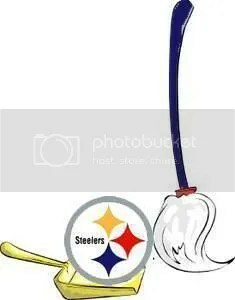 The season sweep of Pittsburgh is just the Ravens’ second in their existence, and first since 2006. Five years ago, the combined score of the two games was 58-7. This year: 58-27. It feels daaaaaaaaamn good. The Ravens, for their part, need to avoid another Tennessee-esque letdown next week in Seattle against a scrappy Seahawks team. They can afford no more hiccups moving forward, especially with the Cincinnati Bengals refusing to go away. We’ll talk more about that later, though. For today, it’s a gorgeous, gorgeous day in Charm City. This entry was posted on November 7, 2011 at 1:17 pm and is filed under Ravens, Ravens Game Recaps. You can follow any responses to this entry through the RSS 2.0 feed. You can skip to the end and leave a response. Pinging is currently not allowed. Hahahaha! How does it feel to lose again, you stupid assholes! ?